The artists at Cerqua Rivera Dance Theater are well known for their music and dance collaborations, but “Alone/Together” is a collaborative effort that goes far beyond the walls of the stage and studio. The program includes part two of ‘American Catracho’ (featured above) – a work whose development began in CRDT’s 2016 season and is slotted for completion in 2019. Movement Consultant Noelle Kayser worked alongside Artistic Director Wilfredo Rivera to create choreographic motifs whose evolution capture the heart-wrenching struggles facing those immigrating to America. From any seat in the audience, you can hear the exaggerated, struggling breaths of the dancers and the labor of their footsteps as they fight their way to what they hope is a brighter future. Kayser uses these dancer-generated sounds as an effective choreographic element that one audience member described as making the movement feel “familiar and eternal”. 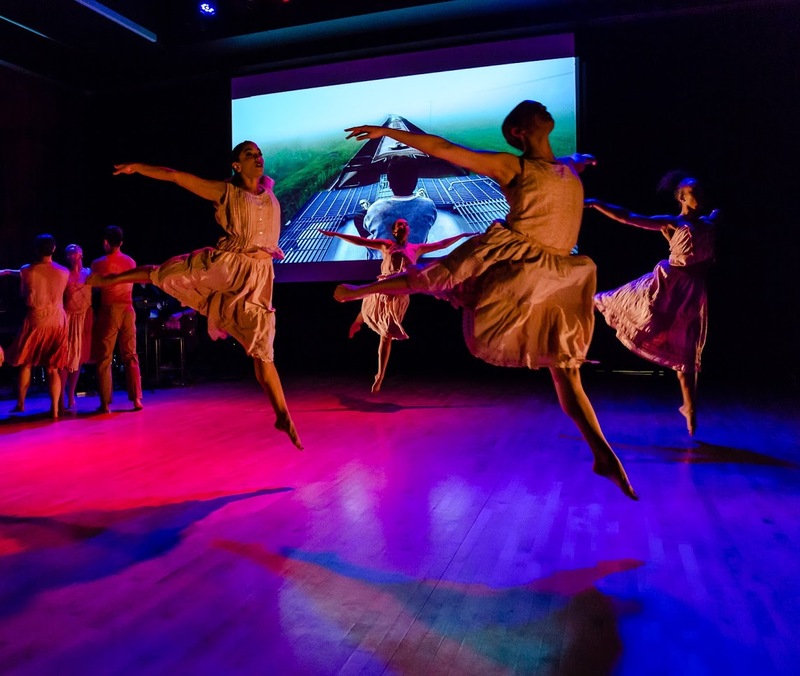 The artists at Cerqua Rivera Dance Theater are well known for their music and dance collaborations, but “Alone/Together” is a collaborative effort that goes far beyond the walls of the stage and studio. CRDT is also consulting with Shawn Lent, a Chicago based social practice dance artist, program manager, dance educator, writer, and facilitator, whose in-depth knowledge of the immigrant community deepens the “American Catracho” experience. In a recent CRDT preview, Lent spoke from the heart about the differences between immigrants and refugees, the process of immigrating to the United States, and the struggles that she works to overcome with immigrant children. Her expertise and experience, along with Rivera’s own immigrant experience, all collide in a refreshing and thought-provoking work that is essential to deepening our understanding of culturally mixed communities across the nation. “Alone/Together” features ‘Sin Fronteras’ – a piece commissioned by the Chicago Sinfonietta in collaboratation with Grammy nominee Clarice Assad in honor of the orchestra’s 30th Anniversary. The score is a fusion of Latin American music and American Jazz (originally made for a full orchestra) transposed for CRDT’s nine piece band. With far less instrumentation than an orchestra, the band brings the Latin rhythms into the spotlight, showcasing both the beauty and diversity of the movement and music simultaneously. The 90-minute program also features two works by renowned choreographer Sherry Zunker, including ‘Vent’ – a hard-hitting, female duet about romantic break-ups that has not seen the stage since 1998. Audiences can also look forward to a world premiere by first-ever CRDT Choreographic Fellow and Ensemble Member, Taylor Mitchell (for more on Taylor and his new work, see our DancerMusic Article by Johnny Nevin). Find your tickets to CRDT’s “Alone/Together” at Links Hall HERE. Learn more about “Alone/Together” by visiting CRDT Online. Here We Come – Alone / Together October 5-21, 2017 from Cerqua Rivera Dance Theatre on Vimeo.